Crime has never been this much fun! 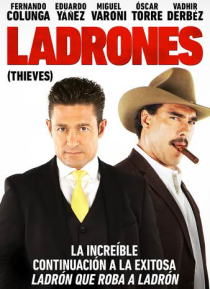 After a ruthless businesswoman steals land deeds from a community of Mexican families, two former thieves (Fernando Colunga and Eduardo Yáñez) come out of retirement to steal them back. With a ragtag team that includes a spiritualist, a clumsy ranch hand, a struggling actor, and an amateur meteorologist, the modern-day Robin Hoods attempt a caper for the ages … in this wildly entertaining sequel to the smash hit LADRÓN QUE ROBA A LADRÓN.